UltraDeck sits above the StudioDeck with same isolated 300RPM AC synchronous motor but uses a 10" MoFi Ultra Tonearm and 1.3" Delrin platter. Can be supplied with UltraTracker or MasterTracker Cartridge. - Dimensions: 19.69" x 6" x 14.25"
Mobile Fidelity UltraDeck 33-1/3 and 45RPM belt drive turntable sits above the StudioDeck sharing the same isolated 300RPM AC sync motor and HRS anti-vibration feet but with a 10" MoFi Ultra Tonearm, 1.3" Delrin platter and powder coated black three layer (MDF, damping, aluminium) body. UltraDeck can be supplied with a pre-mounted and aligned UltraTracker (UltraDeck+) or MasterTracker (UltraDeck+ M) cartridge. “Ultra” describes Mobile Fidelity Sound Lab's philosophy and represents their dedicated pursuit of the highest level of reproduction of recorded sound to deliver music lovers with the experience of listening to the Original Master Recording in their home. Regardless if you're enjoying a standard LP or a limited edition UltraDisc One-Step record, UltraDeck will reproduce faithful playback of the detail in the grooves. Custom built in the USA, the 10" Ultra tonearm employs smooth, premium-grade ball bearings for low friction in the vertical and horizontal plane so you hear only that which is in the grooves. Cardas Audio wiring preserves the purity of signal from the headshell cables down to the supreme gold-plated RCA connectors. UltraDeck features a huge 1.3" Delrin platter. The raised mass results in blacker sonic ambience and lowers noise floor. 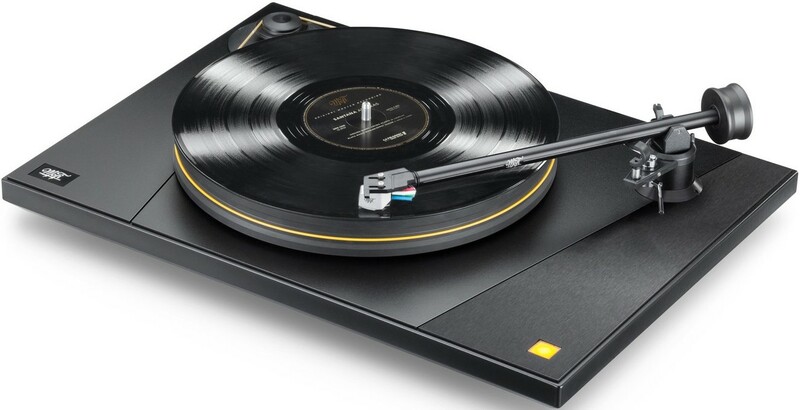 It is an advanced polymer developed by Dupont and its crystalline-concentrated build presents a great impedance match to vinyl records, effectively earthing undesired noise and averting it from the stylus. 300RPM stepped-pulley AC motor delivers exceptional speed stability for rhythmic drive and pitch accuracy. Delrin pulley has dual positions for 33 1/3 and 45 RPM speed choice. 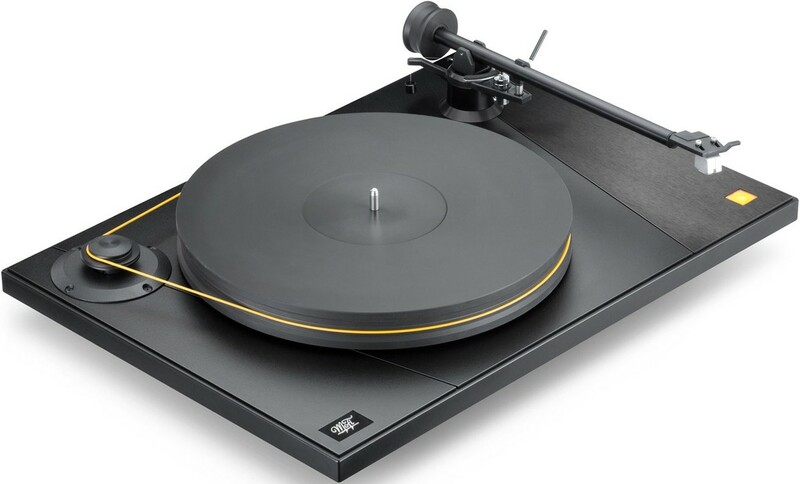 Motor vibrations are averted from the platter and stylus through advanced dampening materials that decouple the motor from the remainder of the turntable. UltraDeck features an aluminium plate meticulously bonded to an MDF body to add mass and eliminate tonal colouration preserving the true sound of the record. Meticulous design and advanced technology, user-friendly features and robust design elements guarantee phenomenal playback, bringing the sound of Mobile Fidelity’s renowned studio into your home. Any vibration of the stylus, that doesn't result from the record grooves, is a distortion that will mask acoustic detail. Developed with the aid of the engineering team at Harmonic Resolution Systems, the global leader in vibration isolation for audio gear, the supplied MoFi anti-vibration feet separate your turntable from degrading vibrations. The hardened-steel inverted bearing mechanism is developed to produce smooth, quiet-spinning stability. The ultra low tolerance mixture of steel, bronze, and sapphire, typically found in costlier turntables, assures many years of incredible vinyl performance.